We said goodbye to Celia in the morning and got back on the road. It wasn’t long before we passed my town namesake, Grey. Travelling the Grey Road out of Grey was a joy, and I once more felt glad to be Grey. We kept ahead of schedule all day, so I thought I’d call Barry the Bottlenose Dolphin when we reached Kalbarri; Dolly had given me his number, and said he was often in west coast waters. I don’t know what inspired me to call Barry in Kalbarri. I shapeshifted into a dolphin again and sent out some long-range clicks, but Barry replied that he was out with the family on an ocean safari off Jungulu Island. However, it wasn’t a totally wasted call, because he warned me there was a storm heading our way, and recommended heading inland. He said there was a friendly meerkat community in Meekatharra that would help us on our way. The horizon was looking grey. Although I half wanted to meet the storm, and see if I fitted in with it, I didn’t feel it was fair to Bonzo; and the meerkat community did sound fascinating. So we took Barry’s advice and headed inland. Hi, it’s Stephen Wolfing, science correspondent at the Greenygrey. Watching Channel Four, I was thrilled to see that my human version in the parallel universe planet Earth thingy, Stephen Hawking, opened the London Paralympics 2012 last night, with an inspiring message about reaching for the stars. The opening ceremony’s emphasis on science and space was nicely timed after the BBC‘s Horizon this week covered the attempts being made to make a 3-D map of the universe, and the current theories on the size and contents of the universe or universes. Amongst many things, it thoroughly explained how our understanding of the observable universe is limited to what light has had time to reach us, and that galaxies are not moving away from each other; the gaps between galaxies are widening because the universe is still expanding. It ended by showing how the universe is thought to be infinite, and could be one of an infinite number of such universes. Hi, it’s Martin ‘Werewolfie’ Adams, sports correspondent at the Greenygrey. I’ve just about recovered from my marathon coverage of Olympics 2012, after my colleagues have found lots of great greenygrey stories to entertain you with since the closing ceremony. 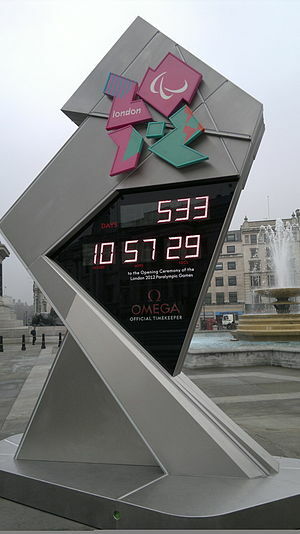 Tonight will see the Olympic stadium filled again, as the London Paralympics 2012 gets under way. The Greenygrey will be there again. If the Olympics showcases the fastest, strongest and most skilled athletes competing in most of the sports, the Paralympics features those with the superminds to overcome physical problems and compete at a high level in the same sports. Some of the paralympians’ achievements are truly amazing, and we wish them all an enjoyable and successful games. Their endurance and determination is a great example of what humanity can do when it sets its mind to it, and all in a positive way. Hi, it’s Harry Silhouetteof-Wolfhowlingonhill, TV correspondent at the Greenygrey, and Andy Wolfhol, creator extraordinaire at the Greenygrey, bringing you a read one, read one free bargain British bank holiday blog bonanza from your favourite value for reading website. After the Chinchillas of Goya (COG) played a central part in Grey’s final battle in its epic comedy-fantasy classic Werewolf of Oz: Fantasy Travel by Google Maps I was thrilled to see the BBC had a documentary about the Spanish painter who created the chinchillas. 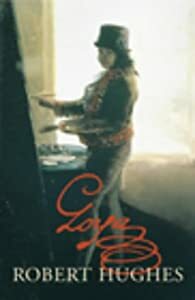 Robert Hughes searched for the truth behind the myth of Romantic-era artist Francisco Goya in the BBC documentary, after Hughes had written a book on the subject; Goya was Spain’s leading artist during the Napoleonic occupation of the country. 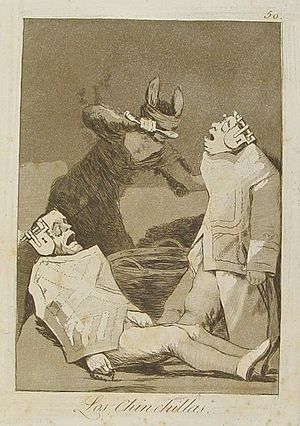 It was a fascinating tale, depicting Goya as a classic artist who tried to use his art to show the reality of human nature, and how he was prepared to suffer the backlash likely to follow. This was epitomised by his self-portrait wearing a matador uniform, symbolising his role as a provocateur. Hughes thought Goya had no option but to try and paint the world as he saw it, as to hide the truth he needed to release might have sent him into madness. Hi, it’s Greenygrey. Further to our explanation about the significance of Grey meeting Bonzo in our last blog, it is of course the Wizard of Oz theme catching up with the Werewolf of Oz. In the Wizard of Oz Toto travelled with Dorothy from the start, but adaptations hardly ever mirror totally, and ours is no different (no, ours is not the greenygrey one below). I said adios to Don and Sancho in the morning, before heading up the highway. Not long after, I saw a ghostly dog apparition hitch-hiking. I greeted it when I reached it. It introduced himself as Bonzo Scottie, before asking if this was the Highway to Hell. I replied that I was a stranger in these parts, but didn’t think so; as far as I knew, it was the highway to Lancelin, which didn’t sound much like Hell. Poor Bonzo seemed upset, as if he had the Downpayment Blues. He said he thought he’d been stripped of his soul, and that he might find it in Hell, which ain’t supposed to be a bad place to be. I said I thought searching for Hell should be the last resort, and I didn’t think it was up ahead, but he was quite welcome to Ride Onwith me. Bonzo agreed, and cheered up on the way to Lancelin; we seemed to reach it in no time. Upon arrival, we met a sea lion called Celia Ono, and she recommended the windsurfing, dune buggying and sandboarding that were very popular on the pristine beaches. We didn’t need much arm-twisting, and had a fabulous afternoon and evening enjoying the beach sports. Celia had great balance, and I had to laugh when Bonzo exclaimed that the Girl’s got Rhythm. AC/DC songs: Highway to Hell, Downpayment Blues, Soul Stripper, Hell Ain’t A Bad Place To Be, Ride On, Girl’s got Rhythm. Yoko Ono (artist and musician). Hi, it’s Greenygrey. We just remembered that we’re supposed to be telling you important parts of the Werewolf of Oz: Fantasy Travel by Google Maps story on this blog, to justify telling you it again, and not just filling up space, and Grey wanted to tell you that yesterday’s chapter of the Werewolf of Oz marked an important crossroads in its epic comedy-fantasy virtual-travel quest across what is known in the human world as Oz. 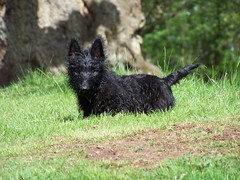 That’s because in the next thrilling chapter of the Greenygrey world’s best ever book, Grey is joined by the ghostly dog apparition of Bonzo Scottie, who bears a striking resemblance to the Bon Scott of AC/DC Grey had seen on stage at the Rock-It festival. So although Grey had met many travellers and characters in the first sixteen chapters of the book, from Chapter Seventeen it has a long-term travel buddy that will accompany it through most of the book, and many adventures. In our Google Alerts Werewolf newsletter this morning we were alerted to a review of The Wolf Gift book by Anne Rice, which seems to feature a werewolf as nice as us, but not a Greenygrey. So we are still alone as far as we know. Here’s the Sun Daily review, and The Wolf Gift on Amazon. Sancho and Don said they were off to the Rock-It festival in Perth, and invited me along. I jumped at the chance; metaphorically of course, because I was in the car at the time. I felt like I needed a bit of fun after a tough time in Latham, and they seemed to be in the same situation having just escaped Cervantes. We had difficulty finding the Joondalup area where Rock-It is held, and had to do a loop around the neck of the Swan River. However, once we entered the festival it really rocked. Tracer started the day off for us with some fantastic space rock. They were followed by a storming Airbourne set, and a great slide-guitar fuelled bluesy show by Rose Tattoo. Brian Johnson era AC/DC played a solid set, and nicely warmed us up for a sensational Bon Scott era AC/DC bad boy boogie headlining show. We were hot and sweaty after the show, so we headed out to Rottnest Island; or Rotto as it’s known locally. There was certainly nothing rotten about it, and we enjoyed the beautiful beaches on the unspoilt island. We were joined by some quirky quokkas: animals that are to kangaroos what greenygreys are to werewolves. They were lots of fun, and provided great company before we fell asleep under the rising sun. 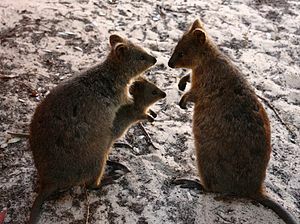 Quokka – a small macropod (marsupial family Macropodidae) about the size of a domestic cat. Tracer, Airbourne, Rose Tattoo, AC/DC (Aussie bands). Bon Scott and Brian Johnson (AC/DC vocalists).